3-Channel Charger comes with a built-in intelligent control chip. It can automatically adjust the charging status. Be based on different charging states, the charger may only charge one battery or two batteries at a time. 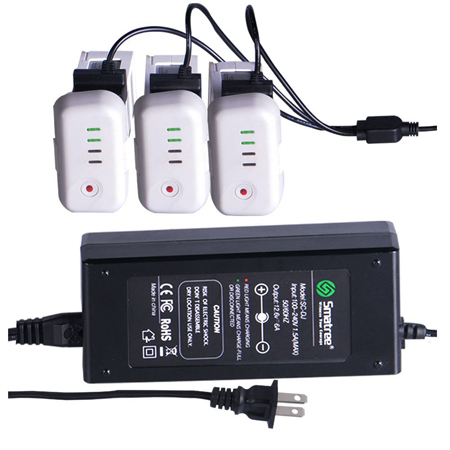 Smatree 3-Channel DJI battery charger is desigined for the users of DJI Phantom 2 and DJI Phantom 2 Vision. The charger has 6A/75W output power , which is higher than the original chargers 4A/50W. When Smatree 3-channal charger charge 3 batteries, it woudnt take much longer time compare to the orginal charger charge one battery. 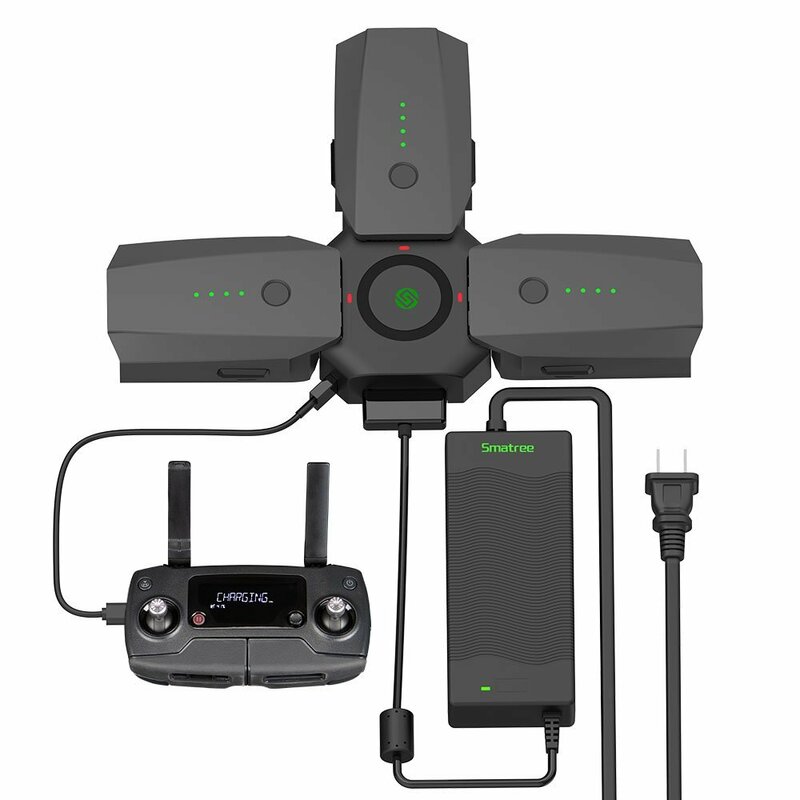 Smatree 3-Channal DJI charger comes with 3 charging connect same to the originals, it is durable and safe. 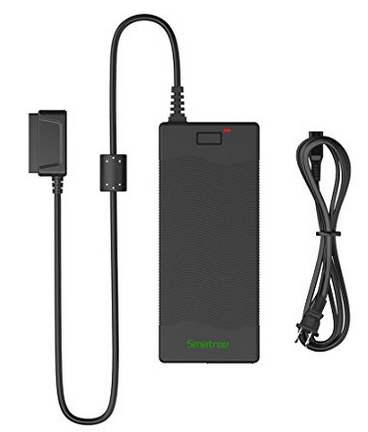 Smatree 3-channel charger comes with a built-in intelligent control chip. It can automatically adjust the charging status. 1)At beginning the charger may only charge one battery or two batteries. 2)During charging, the charge might shift sequently from charging one battery to other battery. 3)It might charge three batteries at same time. Smatree:emoji::Your support is our best motivation. If for any reason you are unhappy with any product by Smatree:emoji:, please do not hesitate to contact Kumu World Customer Service with your order ID. We take full ownership and responsibility for the quality of our products and will do our very best to solve your problem quickly and efficiently! Smatree:emoji: is a registered trademark protected by US Trademark Law. Smatree:emoji: products are sold by authorized sellers only. Kumu World is the sole agent of Smatree on Amazon. This is a great charger. It is able to charge all 3 of my DJI batteries at the same time, and quickly at that too. Don't forget to turn the batteries on or it will only charge the first one you connect. This charger works just as good as the original if not better! Have always needed a good charger to take on the road with me. This is portable and reliable. I had no problems charging all 3 batteries like other people have noticed. Great product. It is very good product. It took 70min to charge one battery and 130 min to charge two baterries. Second battery was turned on while charging. Each Time baterries were at about 12-15% (Phantom low baterry warning) and after charging Phantom Assistant showed 99% each time. I also like lenght of the cables- long enough so I can comfortably place betteries where I want while charging and short enought to not make a mess in my Phantom case. Quality is like other Smatree products- very good!